We’ve all wondered what our pets are thinking, but would you believe a gadget that claimed it could translate their thoughts into human language? 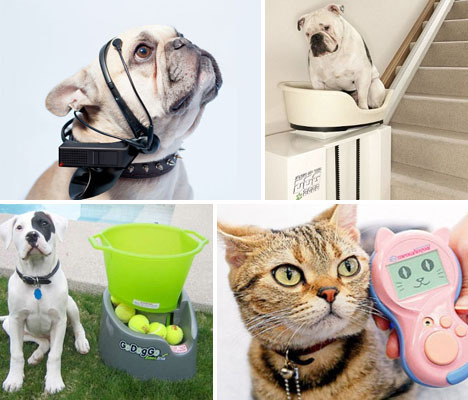 Some gadgets for pets are fairly practical, tracking their location or the amount of exercise they get every day, while others veer into the absurd, like stair lifts for fat dogs or devices that tweet their activities. 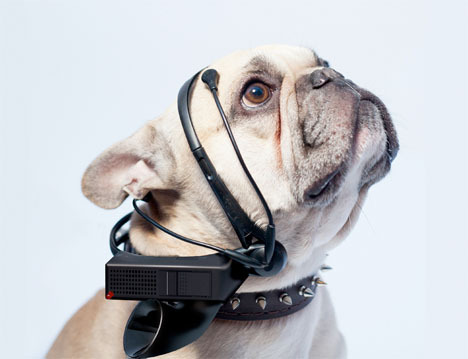 This goofy-looking headset called ‘No More Woof’ by Scandinavian research lab The Nordic Society for Invention and Discovery uses micro computing and EEG technology to read a pet’s brain waves and spell them out in English through the attached speaker. Specific brain wave patterns are associated with feelings like fatigue, hunger, anger and curiosity. Of course, there’s no way for the consumer to verify that the readings are accurate. 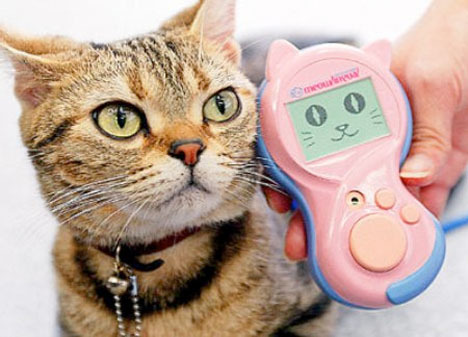 These cute little gadgets – one for cats, one for dogs – also claim to break down the communication barrier between humans and our pets. ‘Meowlingual’ and ‘Bowlingual’ supposedly work by listening to the sounds pets make and then providing a human translation. Attach this little device called The Whistle to your dog’s collar and you can monitor walks, play and rest. Why would you need to do that? Well, there is a practical reason for this one: you can analyze whether your dog is getting enough exercise every day. 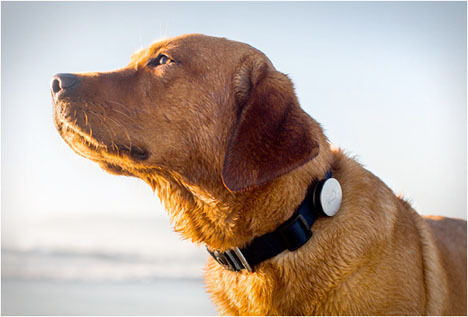 It also acts as a tracking device if your pet is ever lost. An accompanying app gives you all the information. If you’ve ever wondered what the world looks like from your pet’s perspective, here’s your chance to find out. 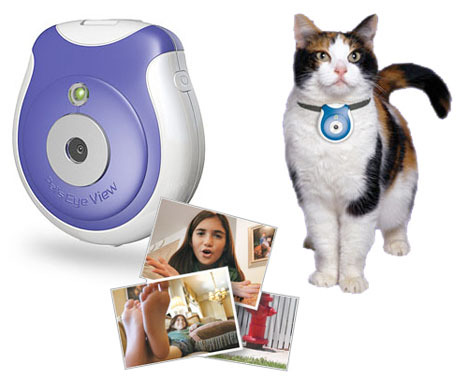 The Pet’s Eye View Camera hooks onto your pet’s collar and can store up to 40 photos. It’s got a waterproof housing, and can be set to take shots at various intervals. Whether you’re just too lazy to play with your dog, or you’ve got the sort of demanding pet that you just can’t keep up with, an automated pet fetch machine might be a tempting proposition. 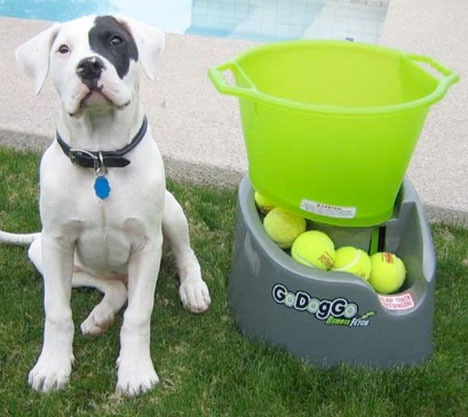 The GoDogGo Fetch Machine is an automatic ball launcher that can throw balls up to 45 feet with 7 to 15-second intervals between launches. It retails for $119.99. We all know those people who think their pet (or child) is simply the most fascinating pet (or child) that ever lived, and that everyone around them wants to hear every mundane detail of their daily lives. 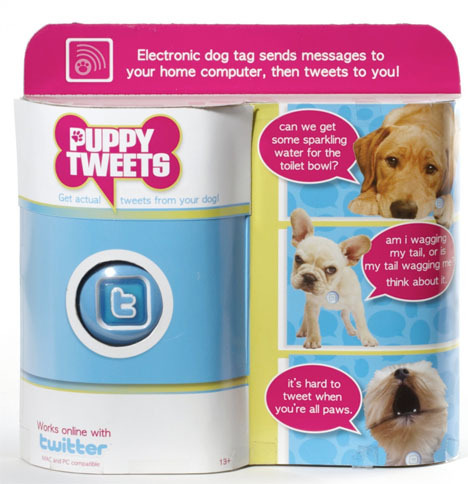 Here’s the perfect gift for that person: Puppy Tweets, a medallion that attaches to a dog’s collar and tweets its ‘thoughts’ to the designated Twitter account of your choice. Engadget tested it out and said the tweets were “cute, and yes, humorous, but completely irrelevant to what was happening in reality.” So your pet’s Twitter account might not be too different from your own. Put your dog to work in a different way with the Woofer, which basically turns her into a walking music player. 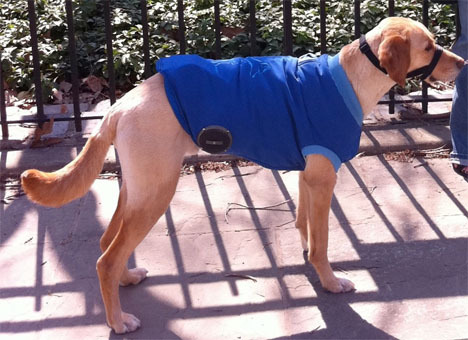 This waterproof dog vest comes with a pocket and USB connector for your iPhone, iPod or other music player, and is fitted with two speakers.